For the WTO MC6, the Hong Kong government had made a 30-second television commercial (see link). (Ming Pao) Yesterday, at the City Forum, the program was criticized: "It dares to say that just because there are more models of mobile telephone, then the World Trade Organization helps free trade. It is too superficial. The citizens should understand the impact of the World Trade Organization from many sides." The Wanchai District Council chairman Wong Ying-kai said: "Watching the goverment ad can make people become stupid." How did we end up this way? The Government Information Service explained that the World Trade Organization talks cannot be explained in two to three sentences. But the promotion clip lasts only 30 seconds, and therefore it must be communicated in the form of a drama. Of course, it was their decision to use the 30-second television ad format. Are there other options? The following chart shows some survey results from the United States. The respondents were asked about various communication channels. 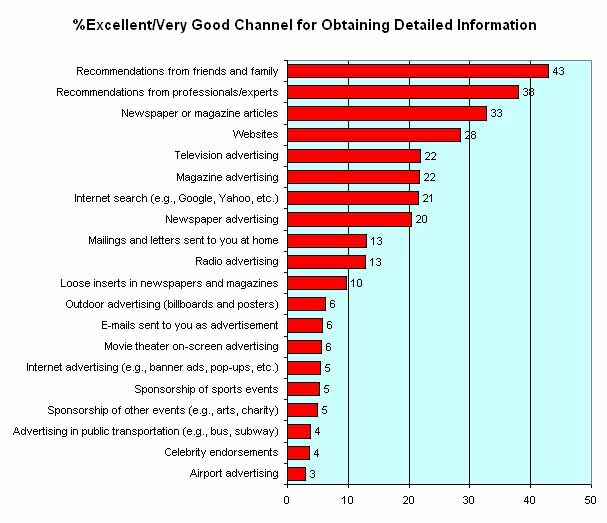 The chart showed the percentages that marked either "excellent" or "very good" for obtaining detailed information on any product or service. The best thing is to speak to trusted friends and family members at leisure and in depth. Unfortunately, the government cannot deliver that on demand. The next best thing is to speak to a professional or expert. While that might work for health (i.e. go see a doctor) or income tax preparation (i.e. go see an accountant), the government cannot deliver in this situation on demand either. To the extent that a 30-second television commercial cannot communicate the details, then the government should have looked at the two other items ahead on the list. While the government is not about to publish its own newspaper or magazine, it can prepare in-depth materials and encourage the newspapers and magazines to explore those issues. Instead, of course, the newspapers and magazines are obsessed with the daily announcements of school closings, business closings, emergency medical services, preparation for riots (e.g. all the bricks in Wanchai are glued to the ground), etc. In lieu, the government can also set up a website that will explore all those issues in detail, and the television advertising could direct viewers to go there (does anyone realize this official HK government WTO MC6 website even exists?). Whatever else, the government should not print some posters of Mickey and Minnie Mouse endorsing WTO MC6 and place them at the airport (i.e. the worst items in the chart).